Kathy Duva, CEO of Main Events – “Oh, if these walls could talk! There are so many stories. If I got started, we’d never hear from anyone today. Main Events could not be happier to be bringing world championship boxing back to Atlantic City. We hope it’s a long, enjoyable stay. “We are back with a bang! “All the fighters in our lineup are excited to be here where so many great names in the past have made big impressions: Lennox Lewis, Evander Holyfield, Arturo Gatti. All our fighters would LOVE to add their names to this list. It will be fun watching them go for it. “This Saturday night in our televised fights on HBO World Championship Boxing, four light heavyweights know the eyes of the world will be on them. They want to make a big impression. You will want to be part of this! But you need to move fast. Our floor and ringside seats are just about sold out. “Tickets starting at 50 dollars are still available through Ticketmaster and Hard-Rock-Hotel-Atlantic-City-dot-com for Saturday’s event or you can watch live on HBO World Championship Boxing® starting at 10 pm Eastern and Pacific Time. 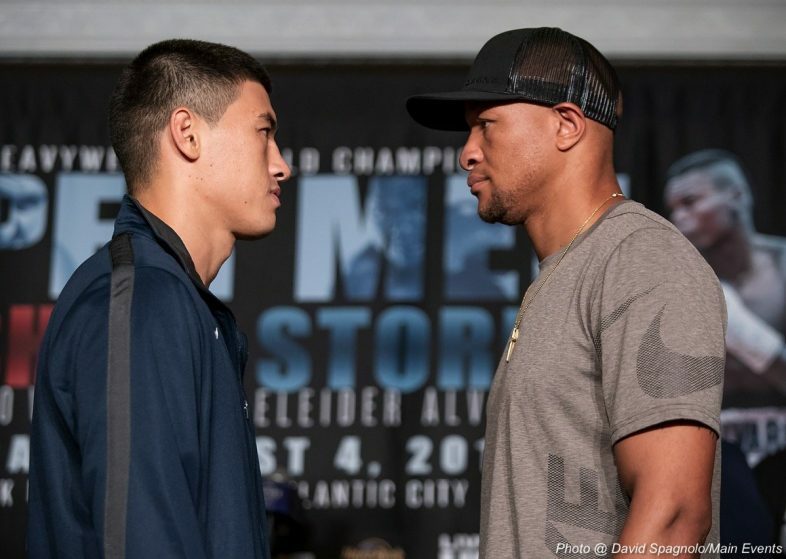 At the top of our card are a pair of exciting fights in the red-hot light heavyweight division: first up are Dmitry Bivol facing his toughest test against Isaac Chilemba. 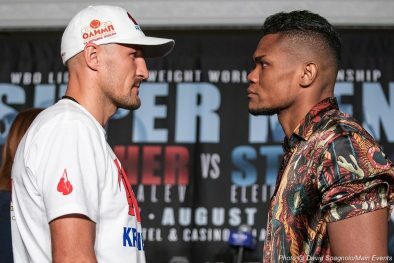 In our main event, two-time light heavyweight world champion Sergey Kovalev against an opponent who wants to hold on to his undefeated record and take a few belts home to Canada, Eleider Alvarez. “On our non-televised undercard, we have our own version of the Fantastic Four from the famed Boxing Laboratory in Oxnard, California. “They are led by top 15 ranked Bakhram Murtazaliev of Russia, who is co-promoted by Main Events and Krusher Promotions, facing Fernando Carcamo of Mexico. This is a ten round IBA Junior Middleweight title fight. We have a middleweight battle between Meiirim Nursultanov of Kazakhstan and Jonathan Batista of the Dominican Republic. This is an eight-round fight which will be televised internationally. “His Kazakh countryman Madiyar Ashkeyev is back after being out due to injury. He is ready to go and fights Eduardo Flores of Ecuador in an eight-round junior middleweight showdown. The fourth of the Fantastic Four is Enriko Gogokhia – or ‘Gogo’ – from Georgia, fighting Ronald Montes of Columbia in a six-round welterweight fight. “Super middleweight Vaughn Alexander’s amazing comeback story continues here Saturday – 11 years away from boxing and he picked right back up where he left off. He is the freshest boxer over 30 you’ll ever see. 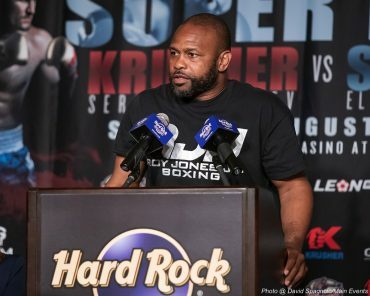 Vaughn plans to make a statement against New Jersey’s Denis Douglin. And he wouldn’t mind upstaging his brother Devon who fights in New York on the same night! “We never forget the local fans who come out to support their neighborhood fighters. Two of our favorites are joining us in Atlantic City. They include Brooklyn’s ‘Notorious’ Frank Galarza and our fighting college student, Ismael Villarreal from the Bronx. And back in the lineup for Main Events after a few years away, lightweight Karl Dargan of Philadelphia returns in a six-round bout against Jonathan Perez of Colombia. Karl has been busy getting married, working in the hip-hop world, and turning up on reality TV. “Twenty-five years ago, Arturo Gatti fought his first fight in Atlantic City on May 15, 1992, in this very arena. It was his fifth pro fight and Main Events’ first fight in the Etess Arena. Which one of our undercard fighters will be the next Gatti? You never know – be sure to watch them and you may have a big story to tell your kids 25 years from now. “We are thankful to our sponsor Leon.RU for joining us on this promotion. 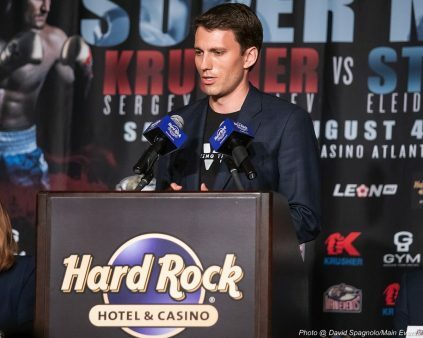 “For this card, we are working with Groupe Yvon Michel, Krusher Promotions and World of Boxing. When people want to make fights, it’s a breeze and a joy. Thank you everyone for your contribution to this exceptional card on Saturday. “Thank you, I hope my voice is clear and easy to listen to. I’m subbing for Peter Nelson, who is the head of HBO Sports, who many of you know. And I don’t know many people in network sports who have the same love and passion as Peter. So, I texted him this morning, and I said, “Is there a hair and makeup allowance for speaking at the press conference?” And he texted me back, and said no, but I can get you a voice coach. So, I hope I am able to deliver today and represent HBO Sports. “As Kathy mentioned, we are thrilled to be in Atlantic City. Talk about memories! HBO, Main Events, Atlantic City — you know what a recipe for terrific fight action. And we are responsible for the television production, and we are responsible, and we are going to embrace Saturday night’s fight. Love being at the Hard Rock. It’s exiting being with some old friends. And we are really delighted we are partnering. And I did want to say that we are really underscoring the global appeal of boxing. We are in Atlantic City and look at the background of the four fighters who are fighting on the two televised cards. Look at where the promoters even hail from. It just underscores the global appeal of this sport. So, I think we are in for an exciting night on Saturday night, once again as Kathy had mentioned we will be on the air at 10 p.m. Eastern and Pacific time for championship boxing with our A-Team. Once again, thank you for having us. “Thank you, Kathy, and welcome everyone to the new Hard Rock Hotel in Atlantic City. It’s a pleasure to welcome everyone here. Welcome Kathy Duva and her awesome Main Events staff. As she mentioned, we go way back and have produced many fights together with her husband and — oh gosh, I can’t tell you how many different champions we have produced together, but everyone from Evander Holyfield to Pernell Whitaker. And the list goes on and on and on. “And certainly welcome to Commissioner Hazzard and the New Jersey State Athletic Commission. Always a pleasure to see Larry, and work with what I consider the best commission. I have worked all over the country and a few parts of the world. They are second to none, and believe me always fighters come first, and their safety. Larry has always been at the forefront of that. “Welcome HBO Sports, Ray, it’s been a while, good to see you. “Most importantly, welcome to the fighters. Mr. Kovalev, Mr. Alvarez, Bivol, Chilemba, and all the great fighters who are appearing on the undercard. Welcome to our great property, and hopefully many return in the future. “What a great night, this Saturday night in the Hard Rock live at the Etess Arena. Of course, Kathy mentioned the arena. We are able to maintain the name of the arena after the great Mark Etess. I am sure there will be a few tears shed by some of us, but it’s a great boxing facility. And we will talk about it some more. “Saturday night marks a major step for this property. Early in our first 45 days of development, we have spoken consistently about the Hard Rock Brand representing many genres of music and different types of entertainment. The Hard Rock has had an enlightenment of classic rock, rock alternative, and country, pop, urban R&B, jazz, blues, comedy. We really represent it all. We have had names like Christina Aguilera, Carrie Underwood, the Howie Mandell Comedy Club, Hall and Oates, Steely Dan, Florida Georgia Line, Maroon 5, Maxwell, Motor City 5, Pitbull, Blake Shelton, Amy Schumer – I could go on and on, but it’s really been exiting to present big time entertainment to everyone coming back to Atlantic City. “I knew from the beginning when she told me HBO was involved and the date, Saturday night in the middle of the summer, that it was the right fit for us. And she mentioned our ticket sales have been excellent. The response from our invited guests have been amazing on the casino side, and we expect well over one hundred media to be in attendance. That’s great publicity for us, that’s great publicity for the sport of boxing and I am just thrilled we can be a part of this. “One thing Kathy did get wrong. She did mention we had twenty ringside seats left. We are sold out, and I am pleased to announce that the ringside area is sold out. We do have a limited amount of the $150 tickets left. We have another limited amount of our $100 tickets and plenty of $50 tickets left. We thought it was very important to keep this fight, this card affordable to the general public and rebuild the interest in boxing in Atlantic City. “Hard Rock Live at the Arena is one of the best arenas to watch boxing. It was designed many years ago, and we had a part in putting the arena together from a technical stand point and made it, I think, a very good place for the media to come in and for HBO and other networks, and it today is very good for us. “It’s really great having Bernie, Main Events, Kathy and all of the team back here in New Jersey again. This propels us, I think, back into big time boxing here in the state of New Jersey. “I first came to Atlantic City in 1978 as a young referee, and I have had the great blessing and great experience to have been around for all of the great fights that have taken place here, either as a referee or as the commissioner. It is great to see one of my favorites, the great Roy Jones Jr. here today, who created so many exciting events with his performances. “Furthermore, it has been a great and exciting adventure for us in Atlantic City. 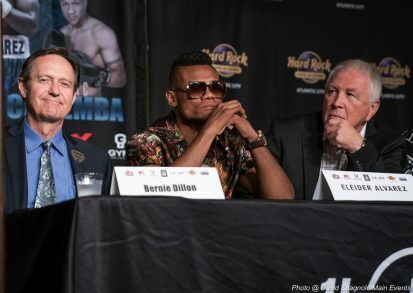 It is great to have Bernie Dillon back as one of the casino entrepreneurs, because as I have often said, we need boxing people back to bring boxing back. So, we are feeling good about this event, an outstanding event that makes us feel great about the future of boxing again here in New Jersey. Especially since we have real promoters back, Main Events and Atlantic City, it is just a great combination and an outstanding event they have put together. “I have sat in my office looking at these bouts, and I told Jolene, you make my job very easy. One of the easiest parts of my job is approving bouts, because everything that comes in here looks like a home run. “Finally, to the media present today and watching live, thank you for your time and your interest. You are in for a real show – the kind of show only Atlantic City can deliver! Years from now you will be able to say ‘I was there’ when boxing made its big comeback in Atlantic City. “On to our co-main and main event fights. The light heavyweight division continues to burn bright. I challenge you to name any other division this competitive at this moment. Any one of the top 20 ranked fighters is a dangerous opponent. And we have the best of the best for you. “Isaac Chilemba of Malawi in Africa has come a long way for this shot. He is currently 25-5-2 with 10 knockouts. But there is something the record doesn’t show. This man has a reputation for making opponents prove themselves. Just ask Sergey Kovalev and Eleider Alvarez. They are both here today, so you can ask them. 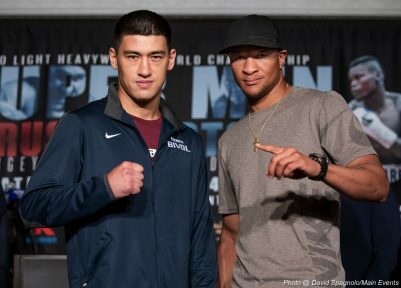 “Chilemba takes on WBA Light Heavyweight Champion Dmitry Bivol of Russia. 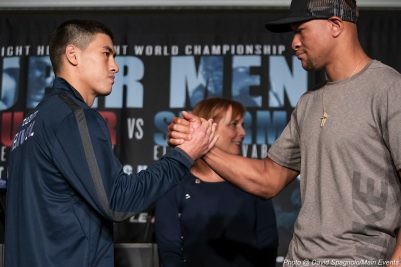 Bivol has 11 knockouts in 13 fights and is undefeated. Chilemba, as we have learned in our long association with him at Main Events fears no one. But his opponents need to have a little healthy fear — or they will be in for a shock. “Let’s hear a few words from Isaac and team. First, I want to wish manager Jodi Solomon a very happy birthday today! I think we all know what she wants as her birthday present. Isaac, no pressure! “First, I want to say – thank God for giving us all the pleasure of being together to fellowship and to see this thing, keep it often in Atlantic City. I want to say. “what’s happening?” and thank you to my man Larry. And so good to see Bernie again, because these guys were around in my heyday. And to see them again just automatically lights a fire in your heart. Because, to me, when I came up, Atlantic City was almost the Vegas of the East. “It was the only place that had casinos, and the only place that had the casino feel. So, when you got to Atlantic City to fight, you feel like you pretty much made it. I got here my second fight, and I dished out a lot of punishment along this boardwalk. It was fun, so I look forward to seeing it again. “So, if he wants to go at it, we will go at it. And we are here. He wants to win, so we are coming to win. It is a great fight night for everyone. 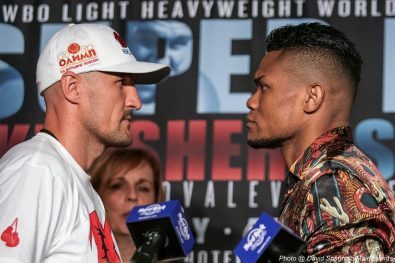 I am looking forward to seeing even the main event, because we know a lot about both Eleider Alvarez and Sergey Kovalev – which is another fight that on any given day, people would think either man could win. “Thank you. First of all, I just want to thank God, HBO and Main Events for this opportunity. I would like to thank my team, Jodi Solomon, Roy Jones Jr., Shadow (cornerman Sibusiso Shabane), the fans, and everyone else out there who is behind me. It was a long road to get here. I had two rough years since I last fought here in the states, when I tore the ligaments in my arm against Oleksandr Gvozdyk. I had to take time off from boxing for more than a year. It was rough for me to go through all that. I made it through all of that and my team did not give up on me. They stood behind me and supported me. They kept telling me that I would be back. “Thank God, my very first fight when I came back was a title fight in Australia. Anyone who has ever fought there know how hard it is to win with the politics in Australia. You have to be on top of your game to convince the judges. We did it and won the WBC International Title. “I want to take a moment to thank Andrei Ryabinsky’s World of Boxing for giving Main Events the chance to work closely with Dmitry and introduce him to the fans in the United States. He is the definition of a knockout artist. Dmitry knows his boxing history. In fact, he knows the legacy of the great fighters here in Atlantic City. “Dmitry said recently in an interview he wants to have one of those fights fans always remember. Guess what fight he picked as an example? Gatti versus Ward. It is a pretty high bar, but you never know what might happen here on Saturday. “Thank you, Kathy. Always a pleasure. First, I want to say a few words about Main Events. A very special company, the whole team, everyone is on top of everything it is so impressive. Fight week with Main Events is so much easier than usual and I thank you for that. Of course, World of Boxing and Andrei Ryabinsky, they have done so much for Dmitry and for us and we would probably not be able to be here without them and I just want to thank them for that. “Of course, HBO, just as Roy said the three letters in boxing that are most important, HBO. 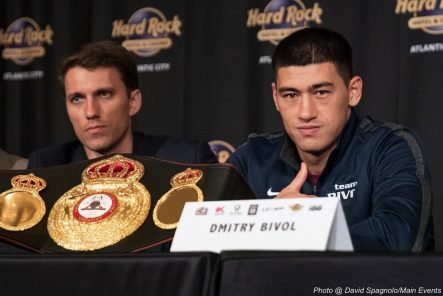 We have had Ruslan Provodnikov, Viktor Postol, many others and now, Dmitry Bivol. Most of these guys are all names that once you say the name everyone in boxing knows. Everyone has seen them, and everybody has heard, and that is what HBO does. And they just really know how to get the PR and the attention the fighter needs and everything else is up to the fighter. “Thank you to Sergey and his team. It is a pleasure to be on his main event. We enjoy being here and being able to watch Sergey on his main event. The whole country is proud of Sergey for being one of the top fighters from Russia. “Thank you for this chance for me to show my boxing skills to many people. I’m really glad. And I’m glad to be here in Atlantic City, because I know there were many great fights, like Arturo Gatti against Micky Ward. I’m glad to be part of boxing’s return in Atlantic City. “When I got my belt, I make one small step to my dream. To be a big name, to make a big name in boxing. Of course, I’m not going to give my belt to someone. I’m not giving my belt to Chilemba. I’m going to keep it a long time. I will try to do my best for boxing fans, for people who watch our fight. I hope it will be an enjoyable fight for you. “The thing I keep hearing consistently from everyone is how smooth things are going, how much better Main Events is, how much it is a pleasure it is to work with us. And I have to say, it’s 100 percent true! But I do not get any of the credit for that. Jolene, Nicole, Lisa, Alexis, Joe, our fabulous PR support team of Gayle, Ed, and Ellen, they are the very best. They work harder than anybody else. Being behind the scenes and watching in recent weeks as I always do as Fight Week approaches – my hat’s off to all of you. You make us look so good, and I want you to know how much I love you all and appreciate it. I’m happy to hear people reconfirm for me what I already know. “Moving on to our main event. 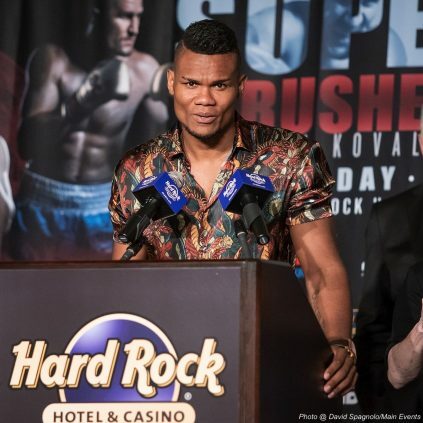 We are happy to have Eleider Alvarez here for just his second fight in the United States. He is undefeated with a record of 23 wins, 11 by knockout. He is coming off notable wins over legendary Canadian veterans Jean Pascal and Lucien Bute. 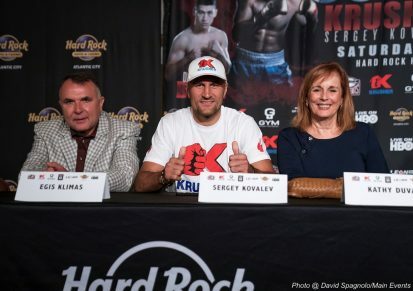 “When others said no to Sergey Kovalev – and I promise you, Jolene can attest to this – many others have said no to Sergey. Eleider and his team did not hesitate for one second. Bravo and how refreshing. Alvarez is ranked in the top five and a legitimate challenger. He has been waiting for two years for the shot that he earned – two eliminator fights, including one with Isaac. He is crafty and smart. And not to be under estimated. “Thank you very much, Kathy. Thank you very much everybody who is here for this press conference. We are very, very happy. You cannot imagine how happy we are to be here, and for several reasons. I want to thank HBO for televising this event. I want to thank Mr. Dillon for your great place here at the Hard Rock. I want to thank the Main Events staff, Kathy for all their collaboration for the making of this event. “Atlantic City means a lot for people in Quebec. It’s been for long, a great vacation place. Also, we used to come here for great boxing events. My first fight here, it was when I came for a world championship with Matthew Hilton, Stefan Willette, and many more. “And I can tell you, that fight has been easy to make with Kathy. And I’m happy, very happy, that finally we have been able to make a big event together. We have done the title eliminator between Eleider and Isaac Chilemba. But for a main event, we started the first time I met Kathy to try to make a deal, it was in 2004. It was for Leonard Dorin against Arturo Gatti. We laid down everything to make the deal, and finally I left the company Interbox then. She went ahead and made the deal with the group that followed up. So, I came here as a spectator. “I met Kathy, and we have tried several times to make other things. But this one, it’s a good one. We’re very happy to fight The Krusher. Sergey Kovalev is a great, great champion. He proved it by coming back. And a lot of people are saying that maybe he’s not the same since the Andre Ward fight. But probably a lot people believe he won the first fight against Andre Ward. The second fight, it’s another story. But he came back and when a fighter is coming back like that, this is showing his true value. “It’s a great, great challenge for Eleider Alvarez against Krusher. But Eleider is ready for that. Eleider Alvarez has come a long way. He has been fighting professional since 2009. It’s been nine years since he moved, he left everything in Colombia, to come to Quebec, learn French, and learn his professional boxing. He’s been world ranked five years. The first time he was world ranked, he became a mandatory contender almost two years ago. He didn’t waste his time, he was a mandatory contender and he got his best win in his career. The best wins in his career have always been against the biggest challenge. When he fought in Monaco, when he came here in Chicago, when he fought Jean Pascal – he always gave his best performance against the best opposition. “Thank you, Yvon, first of all I would like to thank HBO, Main Events, and Groupe Yvon Michel for coming together to give us that great opportunity. I would like to thank also Sergey, he has no obligation to give us that chance. Win or lose, he is always going for the biggest challenge possible. And as a coach, as a boxing guy, I respect that, I have a lot of respect for this. “Good afternoon to all of you, First, I want to thank God for being able to actually be here. Thank you, HBO, Main Events, Kathy Duva, Groupe Yvon Michael, to the members of my team, and my manager who’s not here right now. Thank you for giving me the opportunity. “With my trainer, I had one of the best, hardest trainings in the world. It’s made me in the best shape I’ve ever been right now. 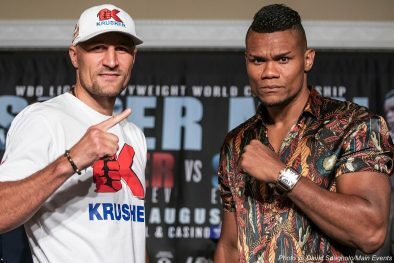 Having this opportunity to go up against a fighter with one of the greatest reputations of any contender I could think of, Sergey Kovalev, it’s an incredible opportunity. I’m very full of pride and joy to let the world know who Eleider Alvarez is. It’s time. “I have a great training team, with Marc right here. We will be ready to go and fight. I have the talent, I am what I am. All I can do is wait to get in the ring Saturday and go for it. 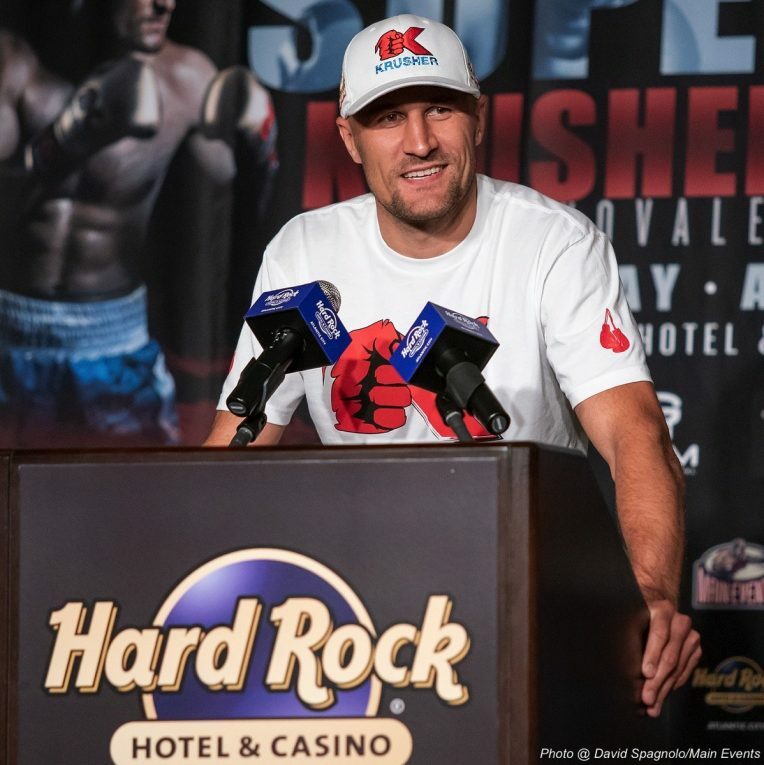 I give my respect to Kovalev. I want to let him know it’s a great honor. But on August 4th, I’m going to be the next world champion. 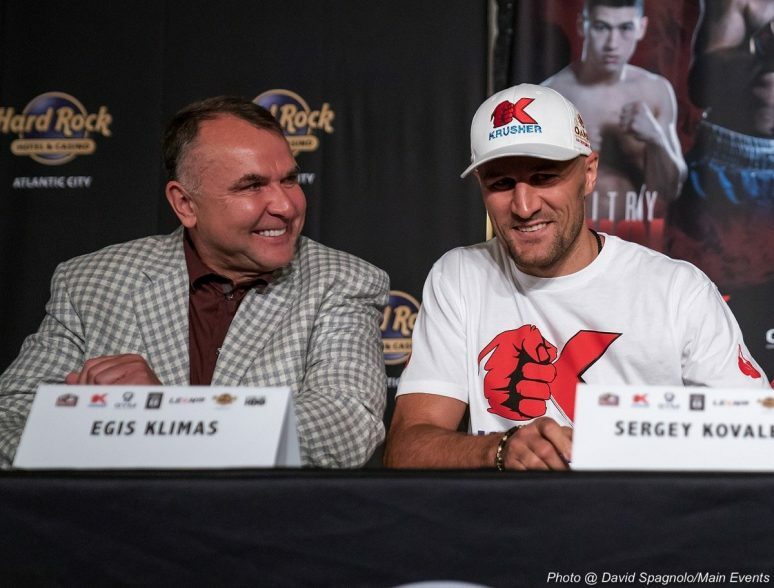 “You know, the last time there was a big fight in Atlantic City was just about four years ago when Sergey had one of those legendary nights with Bernard Hopkins here and walked away with three world titles. You think about it and here he is bringing it back, and when you think about it, it kind of makes sense. In my lifetime in this sport, the fighters who probably were the absolute favorites here in Atlantic City were Mike Tyson and Arturo Gatti. What those two have in common with Sergey Kovalev, other than being knockout artists, is they kind of have an attitude. Okay, and we know Sergey has an attitude, but it makes sense because this is Jersey. We all have an attitude, and I think that’s why this guy from Russia fits in so beautifully here! “And Egis just said to me he’s got four ringsides for the highest bidder, if anybody wants it. Tickets are in very short supply. “And so finally we move on to the man. And you have all heard that saying. right? ‘To be the man, you have to beat the man.’ Well, Sergey is the man in this very competitive division. And you don’t have to just take it from me; just ask any of the light heavyweights whenever they win a fight and gets asked, “who do you want next?’ They say Sergey Kovalev — you know, until Jolene calls them up and offers them a fight. “But he is hungry, and he is looking forward. He has one goal left before he retires, and that is all of the belts. So, let’s hope all of the other champions cooperate this time. And if they do, we are in for one hell of a good time. “Hello everybody and welcome to Atlantic City, with a venue nobody thought we would be seeing, this Hard Rock. So, thank you for the hospitality. “Great news! First of all, I have the best seat in the house between two champions. Second, Kathy just mentioned they have four ringside tickets, which I can sell for $800. she didn’t mention the price… going once, going twice No? Okay, we’ll deal later. “Hi everyone. What can I say, but I am really glad to be here at one of the famous places of boxing, Atlantic City. I am very happy to be fighting here. “Atlantic City is back in the boxing business and business is good! Once again, tickets start at just 50 dollars and we’re definitely heading for a sellout. Frankly, the 50s are mostly all that’s left. They are available through Ticketmaster, through Hard-Rock-Hotel-Atlantic-City-dot-com. Or you can watch live on HBO World Championship Boxing starting at 10 p.m. Eastern and Pacific Time. 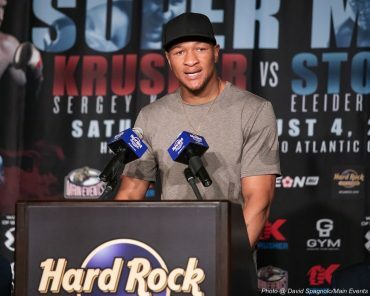 “My thanks to all of the talented and dedicated people working hard to put on this impressive show Saturday – that includes HBO, Hard Rock, New Jersey Athletic Control Board, World of Boxing, Krusher Promotions, Groupe Yvon Michel, and Main Events. “But I do need to single out one person. That is 2015 NABF Matchmaker of the Year, Jolene Mizzone. The guys have to do the fighting, but Jolene makes the magic happen and does most of the sweating. There is simply no matchmaker in the world with her eye. Will you please give Jolene and the rest of our team a round of applause? Previous boxing news: Richard Commey vs. Yardley Cruz this Sat.